Since the last post on this site more than a year ago Cork County Council granted permission for development 16/07122, opening out into Monacnapa through the site above. A group of local residents came together and appealed to An Bórd Pleanála last September, pointing out the many problems we saw with the plans. An inspector from An Bórd Pleanála inspected the site and recommended that permission be refused but her decision was overturned by the board members of An Bórd Pleanála. 8.1. Based on the above assessment I recommend that permission be REFUSED for the proposed development for the reason and considerations set out below. The site is within an area zoned for residential development where it is the objective of the planning authority as expressed in the Blarney – Macroom Municipal District Local Area Plan (August 2017) to provide for Medium B Density Residential Development subject to satisfactory access to public road. This objective is considered reasonable. Having regard to the backland location of the site, the significant works required to provide access to the site and the gradient of the proposed access road serving the site it is considered, notwithstanding the proposed improvements, that the intensification of use which would be generated by the proposed development would endanger public safety by reason of traffic hazard and the obstruction of road users. Therefore, the Board is not satisfied that satisfactory access can be provided at this location. The proposed development would, therefore, be contrary to the proper planning and sustainable development of the area. Having regard to the backland and elevated location of the site relative to adjoining established residential developments together with the topographical constraints associated with the site and the steep sloping boundaries adjoining existing residential estates particularly to the north it is considered that the scale of development proposed and proximity to adjoining established residential developments would result in overbearing impact on adjoining properties. The proposed development would, therefore, be contrary to the proper planning and sustainable development of the area. It’s disappointing for us. 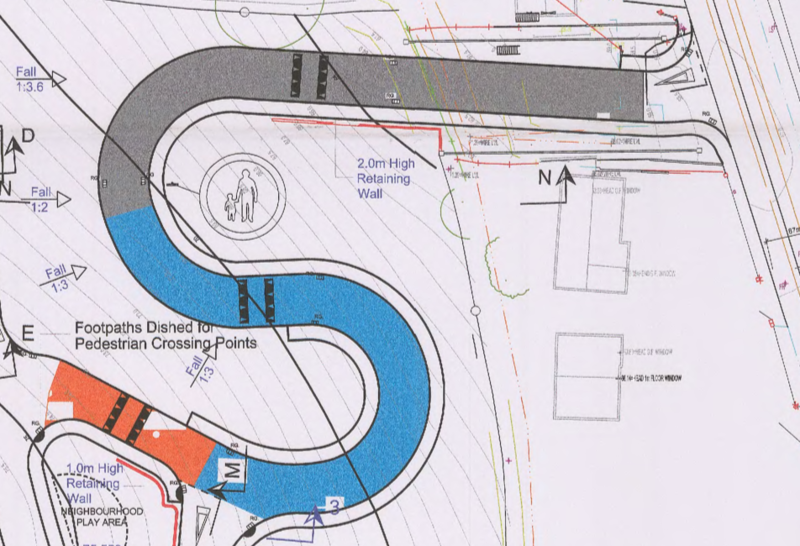 There are problems with the plans but I’m glad to see the entrance to the estate has three speed cushions to slow down traffic. The grey section of the road slopes at 10%, blue at 8% and orange at 7%. We’ll keep an eye on things to make sure everything goes as planned. I still wonder how they’re going to get delivery trucks down Mangerton Terrace and out by the convent to the bypass. 2018-04-12: This morning there has been activity! The digger is now on the property. Pingback: Why is our car all dusty? | Something Odd!